A personalised beach wrap is a perfect way to show off your summer style by the sea. Design your own wrap to create a unique multiway dress, which can be easily transformed from casual wear to an elegant evening outfit. This versatile garment can be worn in a multitude of ways, bringing you several outfits for the price of one. Add a touch of glamour to your beach holiday with your own customised beach wrap dress. Choose from two stunning fabrics – Paris Chiffon or faux Silk Sensation - to bring class and elegance to the look. The wrap can be worn in a huge variety of ways; experiment with wearing it tied as a halter neck dress, a midi skirt, a short sarong, a tube dress, or many more. 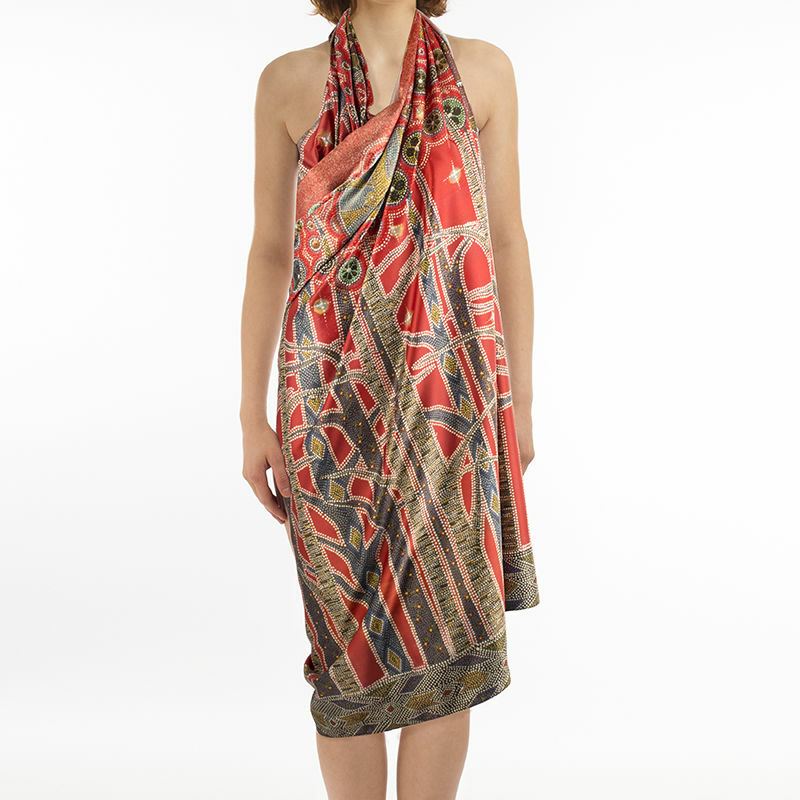 The possibilities are endless with these beautifully printed multi-way beach wraps. Choose from classic long or plus size long for a full-dress style, or classic short or plus size short for more of a skirt wrap. Your wrap is handmade to order in our London factory, printed with environmentally friendly inks and ethical practices. Change up your Summer style with ease with your very own beach wrap. I've ordered a few times and always had great service - and the quality of the beach dress wrap is amazing. Will definitely order again! super soft, versatile, love it. What Will My Printed Wrap Look Like? Your personalised beach wrap will be printed onto large pieces of rectangular fabric, to allow you to wrap it around your body in a variety of ways. Both fabric choices will showcase your design beautifully. Paris Chiffon is silky, soft and sheer with a transparent element, meaning your designs will look stunning when they catch the sunlight. This luxurious material is ideal for hot destinations as it’s so light and breathable but will keep you cool in the heat. Alternatively, try the Silk Sensation, a faux silk fabric with a beautiful nature drape. The surface is smooth with a very subtle shimmer effect, again bringing your designs to life as it reflects the sunlight. The faux silk is incredibly comfortable to wear and slightly stretchy, making it easy to move into different styles. Care instructions: Your new personalised beach wrap can be hand or machine washed at 30 degrees. Dry flat or hanging. Who Will Love These Beach Wraps? Beach wraps can be worn by anyone – the personalised wrap can be printed with a design to suit any individual style. As well as being a glamorous holiday wrap, you could also design half-sizes to protect your children’s shoulders and back from the sun. They make the ideal cover up for any age or style! Whether you’re a fun-loving youngster or a beach-loving grandma, the wrap can be worn in a way to suit everyone. Your unique print design will be brought to life with sublimation dying, which allows the inks to lock directly into the fibres of the fabric; ensuring a long-lasting print. Expect vibrant colours, sharp detail and an even and consistent tone on your printed design. Choose a busy print for your wrap, so that no matter what way you wear it, a beautiful pattern will always be visible. Alternatively, create a photo collage montage to showcase the best snaps on your new garment. Be inspired by your upcoming holiday by creating a design with vibrant botanicals, tropical birds and warm tones; the perfect look for a trip to the beach. For a look which will transform from day to evening seamlessly, experiment with Ombre print designs in a more muted palette. The fading of colour in subtle tones means you can easily jazz up the outfit with evening accessories or different footwear. If you fancy creating a mix and match outfit, why not order two short length beach wraps? This way you can wear one as a top, and one as a skirt – the perfect holiday two-piece. Experiment with contrasting print designs or block colours to add an extra pop of vibrancy to your trip. Our Photo Swimsuit has been designed in-house and every piece is made to order, to ensure you receive a unique swimming costume.